Introduction: The discovery of metals was the stepping stone towards civilization. The metal are kown to man form the pre biblical times and differnet civlizations used the metal to make products for religious, hunting, weapon, house hold and ornamental purpose. Now, man is dependent on metal for cooking to traveling. A seperate department called the metallurgy studies the entire process of working the metals for various applications. Pure metal are chememical element, that cannot be further broken down into other substance. There are hundreds of such substances, of which some are found in the free stare and other are found in combination with silicon or other elements. Metals are generally shiny, strong, hard, brittle and good conductors of electricity. But, they have varying amount of each properties. Some metal like mercury are found in the liquid state on the other hand metals like lithum are very heavy. Each element has its own characteristics according to which they can be used for different purposes. Some are malleable which means they can be streched and pulled while other are ductile which means that they can be hammered and squeezed. Metallurgy: Metallurgy is the science of metals which deals with the extraction, purification, alloying, heat treatment and working of ore. Since metals plays an important part in all type of activities, metallurgical is an important division of scinece studies. 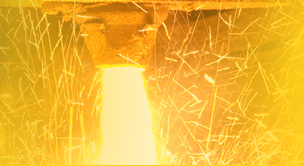 The metallurgy department has been divided mainlty into three branches- extractive metallurgy which deals with the extraction of metals, physical metallurgy which deals with the structure and properties and production metallurgy which deals with designing and finishing the the metal into useful products. The entire process of extracting the metal from the ore to shaping them into products is known as metal working. Metalworking Process: The main process involoved in extracting the ore is to melt the ore by heating. Some ores are found relatively pure in nature and others are to be exttracted from the complex ores. Different method are used to remove the impurties like pounding the metal to chip of the impurities or by reshaping the raw ores. However, the predominetly used method is of melting the ores andseperating the metal from the other elements. The removal of impurities can be done two times. First, when the ingot is made near the mines and the second time when the intro is melted for reworking at the craft production sits away from the source of the ore. When the metal is melted at a high temperature the molten metal gets deposited in the bottom and the impurities better know as slag floats on the top.The process of removing the metal from the impurities is known as smelting. After which the extracted metal is shaped into blocks or bars that is known as ingots so that it is easy for storage, transportation and further processes. Eg. of smelting is when copper or is reduced to copper through mixing carbon with the ore and heating the combination. 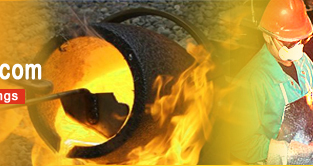 Casting and forging are the most widely used method for shaping the metals into different products. Forging: Also known as hammering method, forging are of two types hot hammering and cold hammering methods. Softer metals like copper and bronze can be shaped into weapon or other items by just hammering. But metal like irons are to be heated so they are soft enough to be shaped into the required form. When the metal is heated the crystalling structure in weakened, therefore the finished product eg. sword in plunged into water so that the crystal structure is restored and the product becomes hard. Casting: The most widely used metalworking method, casting can be done only if the metal is completely melt. Therefore, iron came later into use, because iron cannot be melted at ordinary temperature and other sophisitcated methods are required to melt it. From the prebiblical time lost wax techniques was prevalently used and even today in some part of India this technique is used to cast broze product like idols and stautes. Alloys: Metals in its pure state generally deoes not satisfy the properties required for casting. Hence, in most cases metal have to comb ined with other element so that they acquire favorable qualities for the product like strenght, ductility, malleability, etc. In an alloy, two or metal combine to form a new metal that has all the properties required for a particular application. Aluminum for instance is light in weight but soft and ductile. When aluminum is combined with other metals, the alloy formed is still light weight, but stronger, harder and resistant to corrosion. The realization of the wide application of alloys was the main reason for the industrial revolution. The alloying process: The process of alloying helps in bettering the physical properties of the main metal that is used like iron and steel. During the alloying process the main changes happens in the engineering properties like ductility and malleability and to some extent in physcial properties like density, reactivity, etc. The scientific reason behind the change is properties in because the smaller atoms are tightly compressed by the foces of the larger atoms. Since the alloy is a mixture of two or more metals it does not have an single melting point. There is a melting range, which is known as the liquidus point in the metal melts. Metals used for alloying: Alloys can be made of one or more metals. The main metal used are aluminum, copper, iron etc. and the alloying metals used with them are tin, zinc, molybdenum, etc. In many cased the alloy is better known by the main material metal that it constitutes of. For eg. an iron rod is made from an alloy but it is known by the name of its main component iron. The metals and alloys used for metal casting are broadly divided into ferrous metals and alloy that contain iron, and non ferrous metals and alloys that does not contain iron. Ferrous: The word ferrous is used generally to indicate the presence of iron in the metal sor in alloys. Iron in its pure state is soft but with the addition of carbon it becomes stron. Pig iron and steel have some percentage of carbon present. Other metals are also added to form alloys. All ferrous metals are magnetic and give little resistance to corrosion. Ferrous metal and alloys are used in a wide range of applications. carbon steel, allloy steel, tool steel etc. Non-Ferrous: These are metal or alloys that does not cotain iron, or has iron is an neligible quantity. They are non magnetic and more resistant to corrosion than ferrous metals. Non-ferrous metals pplay an important role in the overall sustainable development of society. Therefore, many countries give prime importance to the study of the minining, production and recycling of non -ferrous metals. Examples are aluminium, copper, lead. zinc and tin. Structure of metals: The structure of a metal and its metallic porperties are determined by the bonding that is formed betweem the the atoms. This is known as metallic bonding. Properties like ductility, malleability and surface finish are determined by the metallic bonding and the presence of free electrons in the crystal lattice. Bi-valve A simple two part mould. Breakdown powder An additive that helps in the easy degradaon of the bond between sand and binder after the casting is over. This is useful especially in removing the waste of sand formed by cores. Core These are molds made of sand or other aggregates that is placed inside the mold cavity to design the internal features. Core are usually inserted after the pattetrn is removed from casting box. Chaplets A metal device used to support the core. Die A device made of rubber or metal that is used for shaping metal while casting jewellery, gear, etc. Size tolerance The variation which may be permitted on a given casting dimension is called its tolerance, and is equal t the difference between the minimum and maximum limits, for any special dimension. Feeders a vent that is provdided in a sand mould through which molten metal can be feed to the cast as it cools. Draft Also called draw, is the taper that is provided to the on the pattern that allow the pattern to be withdrawn from the mold. Flask A frame that is used to hold the mold of sand, plaster, etc for metal casting. Shaped in any convenient form like square, round, rectangular, etc. flasks have only sides and no top and bottom. Bulk manufacturing The manufacturing of heavy metal for the autombile and other heavy metal industry in large scale for making the production process cost effective. Methods mostly used for bulk manufacturing are permanent, die, centrifugal, and continuous casting. Sprue Leads the molten metal from the ladle to the spruce well. Mold Cavity The cavity formed in the shaped of the pattern, when the pattern is removed from the molding materials. Solidification The process of tranfsormation of molten metal in a solid piece of alloy. Choke Smallest portion of the gating system that is uded to control the flow of molten metal from the ladle to the sprue well.